Stucky Chiropractic is a family-owned chiropractic office that has been in business for over 50 years. They are considered to be among the leaders in chiropractic care in Western Wisconsin, providing chiropractic care, massage therapy, and Nutrition & Wellness education. 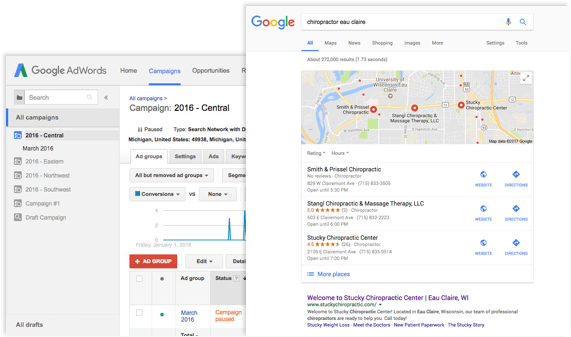 Stucky Chiropractic’s marketing goals were to grow and maintain search market dominance, as well as position their brand as a community wellness resource through their events and blog. Stucky Chiropractic struggled to generate new patients on their website. It lacked an intuitive layout, was tonally dark and was difficult to navigate. Furthermore, it didn’t match the tone or visuals of the Stucky brand: Stucky’s offices (and their personalities) are bright and welcoming, and the website created a disconnect that was doing their business an injustice. They needed a mobile-responsive website that would be easier to use, and easy to find on the web when potential customers were looking for chiropractic, massage, and nutrition/wellness services. 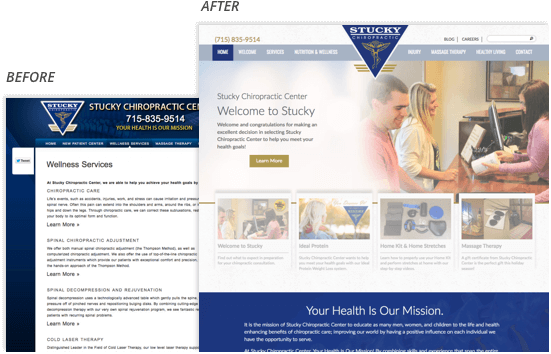 Stucky Chiropractic’s redesign brightened up the mood of the site, better reflected their positioning as a community wellness resource, improved the user experience and brought new patients to their clinics. Stucky Chiropractic’s goal is to be the local community wellness resource. To that end, we serve Stucky Chiropractic as their ongoing search engine optimization and inbound marketing partner to generate new content and constantly improve their search rankings. Higher rankings for more topics mean greater awareness in the market, and ultimately more trust and patients.